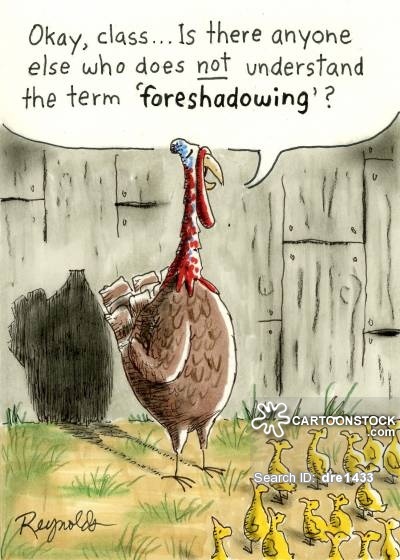 There’s a great post by Harvey Chapman that talks about the different methods of foreshadowing. I won’t discuss them all, but I’m going to give you examples and highlight which method is being used. It can be hard to pick just one method, so please forgive me for some shilly-shallying. Dozens of examples, from the moment Juliet meets Romeo. She sends her nurse off to find out who Romeo is, telling her nurse that if Romeo is already married, “my grave is like to be my wedding bed.” i.e. she’ll kill herself instead of marrying Paris. Romeo is unmarried, so she does get to marry him, but then she still kills herself instead of marrying Paris. D’oh. That’s foreshadowing by naming an approaching event either directly or indirectly. Here it’s indirect. She’s not actually saying she thinks she’s going to die; she’s just expressing her desire to be with Romeo in a melodramatic way. In the first book, The Fellowship of the Ring, Frodo gets to Rivendell and says hopefully, “So far, my only hope has been to get here (Rivendell.) I hope I shan’t have to go any further… I have had a month of exile and adventure, and I find that has been as much as I want.” Poor Frodo. Foreshadowing by a character’s feeling of apprehension. Frodo fears that there is more dangerous travel to come, and he implies that in his dialogue. 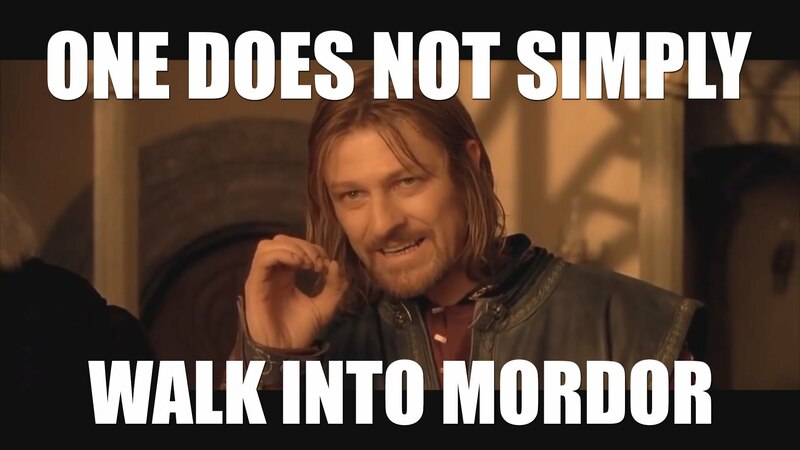 Also in the first book, Elrond says to Boromir, “Slow should you be to wind that horn again until you stand once more on the borders of your land and dire need is upon you.” Sadly for Boromir, the next time he uses the horn, he definitely needs that help to arrive. What category do you reckon? Perhaps also naming an approaching event? In Men at Arms, someone says you’d “have to be a fool” to try breaking into the Assassin’s Guild… and later the criminal actually disguises himself as a clown (“a fool”) and sneaks through a connecting door between the Assassin’s Guild and the Fools’ Guild. Foreshadowing by expressing an opinion. When Jane gets sick while visiting Netherfield, Elizabeth comes to see her, and she’s chatting with Mr Darcy and they bring us the possibility that Mr Bingley would have to leave Netherfield if a friend asked him at short notice. Darcy implies it would be a shameful thing to be influenced so easily by your friends, while Lizzie says it’s only natural to be influenced by your friends and loved ones. Later, Bingley does leave Netherfield in a hurry – at Darcy’s request. Foreshadowing through a pre-scene. They talk about someone leaving but it doesn’t go further than talk, so the reader can infer that the next time they talk about leaving, someone will actually end up leaving. Ron and Hermione in The Philosopher’s Stone. In book one, Harry Potter and the Philosopher’s Stone, Ron says about Hermione, “Whatever house I’m in, I hope she’s not in it.” (p 80) Well, there you go; she ends up in his house. Well, that could be either expressing an opinion or naming an approaching event. 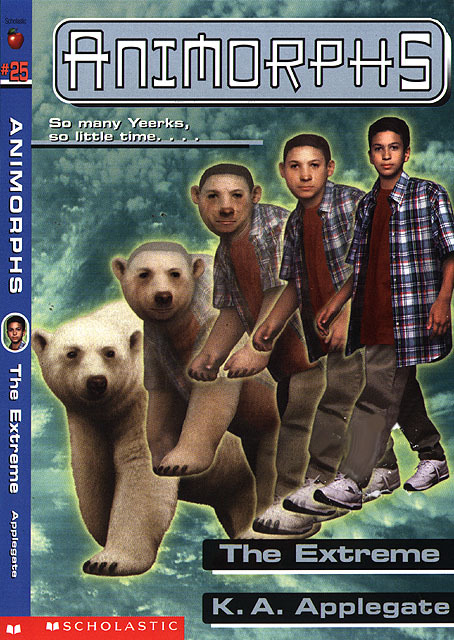 Marco turning into a bear in book 25 The Extreme. Marco: “We’d be totally famous [if people found out]. We’d get to be on Letterman for sure.” By the end of the series, they’re so famous that Marco goes on Letterman and then gets his own show. Visser Three: “And then I’ll be Visser One.” Yep, he does in the end. Jake: “I think maybe the Andalite meant even more to Tobias than to the rest of us.” Turns out the Andalite Elfangor was actually Tobias’ father. In this story, the town has a tradition of stoning one townsperson to death every month as a method of population control. In the beginning of the story, you can tell by the way the people act around the stones that they will play an important part in the story – even though you don’t yet know that someone will later be stoned. Foreshadowing by apprehension in some characters. In season 2, when Rory and Jess meet for the first time, you can tell that they are attracted to each other, even though Rory is going out with Dean. Spoilers, Jess steals Rory away from Dean in season 3. Pre-scene, where the first meeting is charged with an emotion that later is re-enacted in greater strength. A classic example of a red herring. The reader is led to suspect the escaped convict and Barrymore instead of the real murderer, who is later revealed in an unexpected confession by Beryl. In book one chapter one, Bella jokes in her narration about going to a new school in Forks, “No one was going to bite me.” Thing is, the back cover of the book already tells you it’s going to be about vampires, so this comes off a bit cheesy. 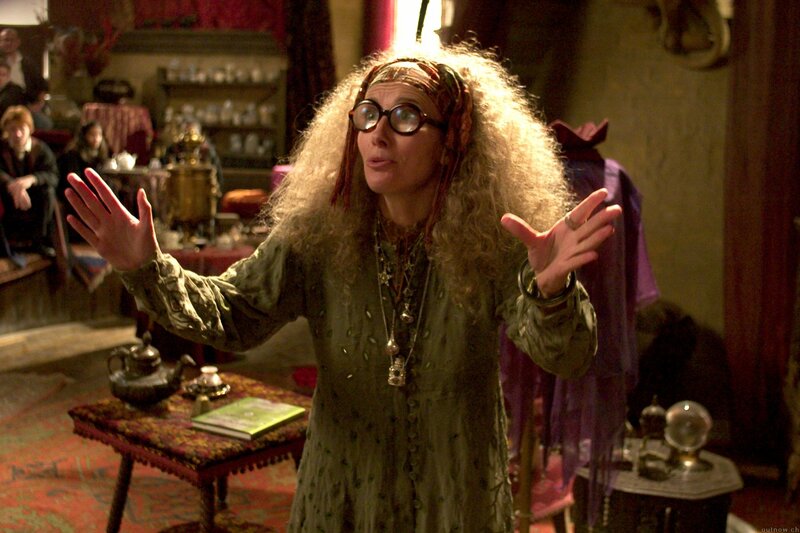 Professor Trelawney is always giving those prophecies that Harry’s going to die, right? *SPOILER ALERT* In Book 7, he kind of does. Mostly dead, whatever. You can see why I hated that book. Plus, she earlier foretells him dying by looking at a card with a tower on it. Someone we know and love dies on the astronomy tower of the school. Sad days. Foreshadowing by prophecy or also this could fall into the category of a character expressing seemingly irrational concern for the hero’s safety. While I was typing this out on my laptop, a massive thunderstorm rolled overhead. Having just written a whole essay on foreshadowing, I became terrified. Danger must be on the way, because the sky was setting the mood for it. Thankfully, I put on Gilmore Girls and finished writing this, and nothing bad happened. Foreshadowing by symbolism or omens. This post was written by TJ Withers-Ryan © 2015. Reblogging is always highly encouraged as long as you credit me as the author.